Like a standard fracture boot, the SmartBoot stabilizes the bones and allows users to rest their feet while resetting the bone and soft tissues. 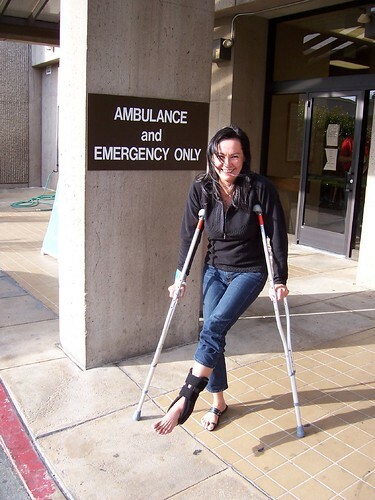 We like putting patients into walking boots rather than casts because patients report less pain and better functionality.2http://www.ncbi.nlm.nih.gov/pubmed/23386764 Recovery also occurs roughly three weeks sooner when patients undergo an active rehabilitation versus a static one. That said, we don’t want patients rushing back into their regular activities before the injured foot is ready to handle the added pressure. The “SmartBoot” is a walking boot with built-in sensors that collect data on the foot’s movement and provides visual feedback to the doctor. This tool is not meant to punish patients who bear too much weight, but rather to guide their recoveries. The SmartBoot could potentially provide the ability to remotely check the patient’s rest levels and assess the amount of movement in the foot once partial weight-bearing resumes. During recovery, patients often have difficulty knowing whether they’re putting too much weight on the injury. Studies show that patient noncompliance rates are high following foot or ankle surgery in particular.3http://www.healio.com/orthopedics/foot-ankle/news/online/%7Bbf3444a9-a9d4-49f6-abf9-7e60c648adb9%7D/noncompliance-seen-with-non-weight-bearing-restrictions-high-despite-instructions-education?sc_trk=internalsearch The SmartBoot could take some of the guesswork out of rehabilitation and let physicians see how the foot responds. “Sensors have become more affordable and smaller, allowing existing protocols to be turned into better tools for clinicians,” adds Brian Knarr, an associate scientist at the Delaware Rehabilitative Institute says. Though the first prototype designed in 2014 churned out inaccurate data, their finished product a year later won third-place at the 2015 Summer Biomechanics, Bioengineering and Biotransport Conference Awards in Snowbird, Utah. There’s still no word on when the new product might be available for use in podiatry offices, hospitals, and sports medicine clinics, but our patients will be among the first to hear of any new innovations coming down the pipeline. The Center for Podiatric Care and Sports Medicine in NYC is your best bet for foot and ankle injury diagnosis, treatment, and rehabilitation. Our board-certified podiatrists and surgeons use advanced therapies to facilitate more effective recoveries for our patients. We have invested in equipment like the MLS pain laser, extracorporeal shockwave therapy device, MIX5 laser, cryotherapy, and T.E.N.S. unit. Learn more about these amazing foot and ankle treatment options for New York City patients here. We have undergone extensive training and performed hundreds of successful platelet rich plasma and biopuncture injections. Our state-of-the-art gait analysis center provides in-depth analytics regarding pressure, foot movement and walking patterns that could lead to injury, and we have all the necessary scanning machines and test equipment needed to arrive at an accurate diagnosis. We have treated professional athletes and Olympians, as well as ordinary folks and children who play sports. Call or stop by to learn more about our two foot and ankle centers in Manhattan and Westchester, New York.